Houzz.com has rated Robert Jennings among one of their select five-star pros—which should come as no surprise to any homeowner, upon gazing over a stunning portfolio of interior design projects spanning from Bucks County, the Jersey Shore and beyond. Maybe, his exquisite and timeless works can be attributed to his background in the fashion industry, or the likes of his globally enriching experiences while abroad in Europe for five years. Regardless, there’s undoubtedly a reason he’s been requested by popular demand. Indeed, Jennings has continually pro- vided homeowners and their respective spaces with only the highest caliber of expertise and resources necessary to develop one-of-a-kind creations. And it can be arguably stated that Jennings knows how to work a miracle or two—after reviving the entirety of a home from the wrath of Super- storm Sandy. 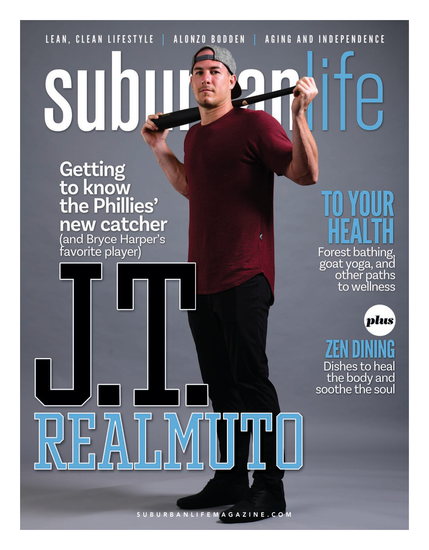 Suburban Life/Philadelphia Life sat down with Jennings to learn more about his creative process and the project that pushed his talents to a new level. You mention your own style and how you prefer your space to have a lively, playful and fun feel. Does this apply to your studio in Lambertville as well? Absolutely. Although my studio isn’t exactly the largest space, it does have a lot of light and a lot of great windows that I display some furniture in. I’ve always had my studio in my home, and this is really the first time I’ve publicly displayed my choices, my de- sign and my love for design. I think of artist Alexander Calder and his playful statues and stabiles along the Benjamin Parkway Drive. The interesting thing about Calder himself, which I also think is true of design, is the evolution of design. Calder ’s pieces are whimsical, fun and strike the mind in a certain way that provokes a thinking of discovery and newness we don’t normally see in a lot of ways. Calder could have been a classical artist, but he wasn’t. He wanted to have fun, and when you have fun in de- sign, you can enjoy it. That’s the approach I take with my space—I like it to have that fun feel, because, well, I enjoy fun (laughs). Besides Calder, where else do you derive a lot of your inspiration from? Nature. If you consider how things grow and the shapes of things found in nature, their unique shapes and patterns really keep your eye moving, similar to the shapes you would see someone like Calder doing. I feel that we’re only imitating nature, even in the way we are and who we are as people. We are a part of nature, and the best thing we can do is reflect it. That said, tell me a bit about your process when redesigning a home. The nature around each project has a great influence. For instance, if a client wanted to do French provincial furniture at the beach, I’d honestly say that’s unrealistic. I really pull in the color palates from the home’s surroundings so it’s a seamless experience. Surely, you can have pops of color—but you really want to bring in the right feel for the location. If I’m doing a Shore home, I’m pulling in those nautical feels, and color palates from outside such as sea grass, sand, sky or water. That leads me to my next question regarding a recent project of yours at the Shore. What was the house like prior to its redesign? This project—or as I’ve called it, Project Helm, because the road the house lies on is called Helm—was very dated. It was a late ‘60s house. It had faux beams in it, brick, carpet cut out to the tile and large tile everywhere. The house itself wasn’t exactly a good set up, but the location and view are incredible. The house was luckily able to be redesigned without being a giant investment. If the house called for that, we would’ve just torn it down and rebuilt. And the neat thing about working on a dated house is you can customize it and make it your own. I think everyone’s needs are different, and those cookie-cutter homes are sort of generalized for basic needs, not customized. I’d personally love to see more custom homes. How did you utilize your design process when deciding where to begin first? What I really looked at was the client’s family dynamic: they have three grown kids that come from the city to visit and usually bring friends, so I wanted the house to be a place that everyone could gather and enjoy good times. After all, that’s what people really want to do when they’re at the Shore. Backtracking to give a visual of how and when we started, this project was completed for a wedding shower, and it was an intense scheduling time of four months. After finishing the project, six weeks later Superstorm Sandy hit, and I had to start all over again. How did you come back from a storm that destructive? The home itself had four inches of water flooding the first floor, and the area’s infrastructure was damaged. This time, we were able to tweak the project a bit more and add some additional improvements such as the pool, completely new landscaping and fencing. I acted as a project manager and interior designer for this project, which is something I love to do. One of the great things about this project is that it has 225 square linear feet of decking around the house, and it’s a corner lot, so not only does it have a great view, but it’s a short distance from the beach. What were some of the items and tweaks used in the second round this project? I really believe form follows function— therefore, I used a lot of slipcover furniture because they’re great for a seasonal house and you can take the covers off and get them laundered when needed. I also pulled in a nautical theme. I used a lot of polished chrome, stainless steel and I incorporated stainless steel boating hard- ware for all of the drapery. For the drapery, I used canvas drapes lined with blackout to prevent sun damaging to the furniture. The floor is light in color and it’s also engineered, so it can take the wear and tear of the client’s dogs. 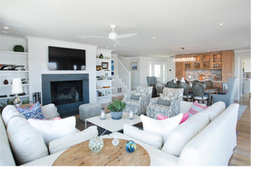 Overall, I honed in on the light and clean colors for the house be- cause of the color palates at the Shore. Besides drawing in nature-inspired color palates, are there any other particular Shore trends you see happening? As far as trends are concerned, I think the Shore used to steer more towards cottages. Now I see a lot of Shore homes be- coming a second home for the way which people live now. You want the home to be smart and functional. That’s what this project really is—it embraces this sort of lifestyle and offers a lot to the homeowner. Aside from your exceptional eye for design, why would you say should someone choose you for their next project? I really think that I can get out of my own way—meaning, I don’t make it about me—I make it about the client. It’s their home and they’re the ones that have to live in it. I want them to be happy and enjoy their home to the fullest. It all ties back to the evolution of design, and I think I’m kind of there with that, and I want my clients to get there, too. I will bring in whatever I can to help them have a beautiful and healthy life—and that life all starts with the home. 14 Church Street, Lambertville, Pa.